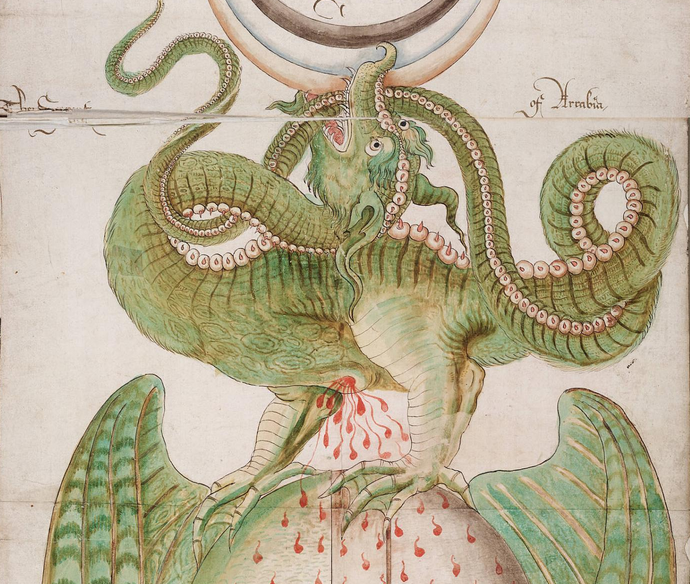 Dragon from The Ripley Scrolls from the 1570 version housed by Yale University. I often meet with individuals or small groups of students, neophyte word nerds, who have further questions or wonderings about words, orthography or even handwriting (everything begins with script, but that’s a story for another post!). Nikki had a question about the spelling of ‘connection’ and from there we found ourselves splashing in various liquidy sidepaths that led us back to mythology. As so often happens when focusing on one word, we touched on so much: briefly the phonology of the letter <c>, Nikki, in passing, explained why <-ion> is the suffix rather than <*-tion>, an all too fleeting examination of assimilated prefixes com- and its allomorphs: con-, co-, col-,cor-, and con- . The latter will be explored in more depth later with the class. Nikki also discovered a new prefix <inter->. We discovered too that this bound base from Latin nectere to tie or bind. 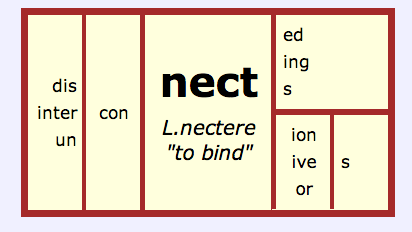 When establishing related words to this base, we discovered nectar which we couldn’t link in terms of meaning to connect as there was no literal or figurative sense of tying or binding. it can be one of the ways to represent a long vowel phoneme; however, not in this case. it can prevent a base appearing as a plural as in ‘curse – curs ‘ or ‘please -pleas’: but again not so in this case as there is no chance of plural confusion (the final grapheme being <x> not<s>. it can also prevent the need to double a single final consonant preceded by a single vowel letter. Nectar- more than the juice of apricots and peaches! ‘Nectar’ is from Latin nectar and according to Latdict nectar means :’anything sweet or pleasant to drink’ or ‘the drink of the gods’. Nikki, a walking encyclopaedia of Greek mythical information, knew that this drink prevented death. 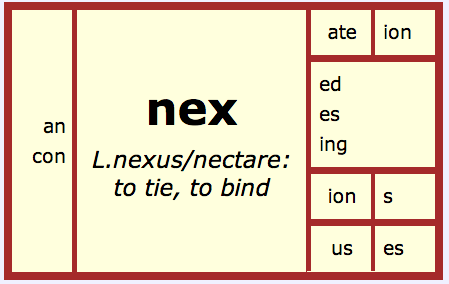 Latin ‘nectar’ is itself formed from a Greek compound:Greek nektar, name of the drink of the gods, which is said to be a compound of Gk.nek- “death and the element ‘tar’ meaning “overcoming,” from PIE *tere- “to cross over, pass through, overcome.” So interesting, read further on Online Etymology Dictionary! Online Etymolgy Dictionary tells us that the word ‘elixir’ is attested in English ‘from mid-13c., from Medieval Latin elixir “philosopher’s stone,” believed by alchemists to transmute baser metals into gold and/or to cure diseases and prolong life.’ This evolved from from Arabic al-iksir, probably from a late Greek word xerion “powder for drying wounds,” which came from the Greek etymon xeros “dry” (see xerasia). ‘General sense of “strong tonic” is 1590s; used for quack medicines from at least 1630s’ . The OED cites T. Hobbes tr. Homer Iliad (1677) From the wound out sprang the blood divine; Not such as men have in their veins, but ichor. Of course, at this point if you are like me, you will want to make a brief foray to purulent to discover the connection to pus and putrification and unearth the Proto-Indo European root *pu- meaning rotting and stinking! Once we’d investigated the ethereal fluid of gods, it’s merely a ‘jump to the left’ to alchemy. Who would have thought connect would lead to alchemy? We had discussed the phoneme /k/ and the various graphemes that represented this: <ch> being the digraph to represent the phoneme /k/, a sure sign that the word was of Greek origin. Yet ‘alchemy’ has the Arabic definite article ‘al’ so not a prefix but a base! So chemist came to English via French chimiste in 1560’s , this from Latin chimista from alchimista. Back to ‘alchemy’ again. ‘Alchemy’ is as we saw from Arabic adopted into Latin but before that from Greek khymatos meaning that which is poured, from Greek khein to pour. So alchemy had been in English longer than ‘chemist’ .’Chemistry’ followed chemist’ in1640s. Roger and Linda Flavell discuss the alternate, but unlikely theory, that alchemy may have been first practised in Egypt with the claim that the root is from the ancient Greek word for Egypt, Khemia. The Flavells note that the art: ‘attracted the Arabs who took it to Spain in the Middle Ages and from there ‘alchemy’ spread throughout Europe’. Why al- is retained in some words of Arabic origin and dropped in others is somewhat obscure. Flavells assert that the growing etymological awareness of al– representing the definite article could have influenced the dropping from words such as magazine, mattress and cotton but this was ‘patchy’ as it stays firmly in place in words such ‘algebra’, alcove, algorithm and alcohol. Apparently out of the several hundred words migrating into English from Arabic only a small percent retain the al-. Such a treasure trove of words to investigate from the Middle East! Hitchings recognizes that Arabic learning was formidable and that this genius impressed English visitors to Spain in the Middle Ages who witnessed Muslim ingenuity in canal and irrigation construction, aqueduct building, orchard planting and garden design as well as logic, geometry,anatomy, music, and medicine. So many words representing the technological aspects of this learning as well as foods and just the sheer romance of the exotic. The <-ist> suffix corresponds to French -iste , Latin -ista , Greek -ιστής. This forms agent nouns from verbs in -ίζειν (see -ize). This is cognate to the suffix -ισμός,-ism suffix. OED states that in English <-ist> is used widely not just as the agent noun of verbs in -ize (besides -izer), as in plagiarize, plagiarist , and with nouns of action or function in -ism , as in altruism , altruist. However, <-ist> is also ‘on the analogy of these’, applied to many words without a corresponding -ize suffix or -ism to indicate the followers of some leader or school, or principle, or the practisers of some art. There are subtle differences between the form in -ist and the native agent noun in -er , cf. conformer, conformist; copier , copyist ; cycler , cyclist ; philologer , philologist . The -ist suffix has connotations of a higher degree of professionalism. We’ve added this suffix <-ist> to the chart we are keeping for derivational suffixes on the classroom wall. Here we note the word class, parts of speech, the final suffix indicates in whatever word is under examination. Below are our discoveries so far. We also have a more extensive google doc ,Suffixes 2013-14, a list of suffixes that students have complied over the years and uncovered through their word inquiries.This list is updated regularly and lives under the glass topped tables so students can become familiar with suffixes and prefixes. This often provides a starting point for students when they first begin morphological analysis giving them confidence. However, with every assertion of a suffix, students need to confirm this by generating other words with the same suffix. Just because it’s on the chart doesn’t mean that’s it! For a while several years back we had believed <fy> to be a suffix. We had noted it’s regular appearance but not considered that it is a base element, one of the many that develop from Latin ‘facere’ to do or make! So the list represents our best thinking so far and it is an exciting moment when we add a suffix hitherto uncharted! ‘Studying language enables an archeology of human experience:words contain the fossils of past dreams and traumas..an assortment of inherited values and cultural traditions, for our language contains traces of the histories of those who have spoken and written it before us’.